The Depths will be the last book I read from this author. While The Enigma Strain was passable, The Atlantis Stone revealed quite a few weaknesses in his writing style. I had hoped The Depths would redeem this author, but unfortunately, that was not the case. There’s too much left unpolished in these books that I cannot recommend people spend their time reading them. In The Depths, the main issues lie more with the scientific accuracy and leaps of logic that don’t make sense. There’s still the problem of too many flat and unimportant characters that were present in The Atlantis Stone, but it’s just slightly better than before. While I don’t want to give away too much of the plot, I felt the writing seemed to be more “stream of consciousness” than something figured out in advance. There are a few main characters, and a basic idea that eventually becomes the central conflict of the plot, but the actions that lead these characters to the discoveries that drive the plot don’t make sense. They feel forced, almost as if these events/actions have to happen to progress the story. And don’t even get me started about providing detailed backstory for minor characters that cease to be relevant to the story immediately after their flashbacks. Scientifically, there was too much in The Depths that was unbelievable. Considering the scale of the operation described in this book, there’s no way it could have remained hidden for 30 years, let alone even be created 30 years ago. I’m OK with stretching physics a little bit to provide an interesting story, but so much of this story broke the science, as well as the logic of human interactions. There’s no way a divorced couple would just happen to board a submarine to search for their missing son. I also didn’t understand the need for the investigator side-story, since it had no bearing on the plot at all. 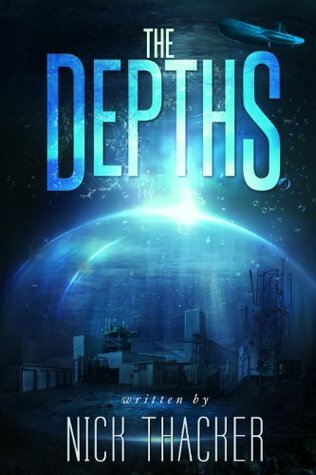 A book that needs a second look from beta readers and editors, I give The Depths 1.5 stars out of 5.